- 5 mn walking distance from public car parks. - Central heating, washing machine. The building 'Palazzo Passerini' takes its name from one of the oldest local aristocratic families that rose to fame during the Renaissance when one of its members became a cardinal and the right hand man of Pope Leo x. This spacious and luminous apartment is situated on the third floor (Italian 2nd floor) of an old 15th century stone building. 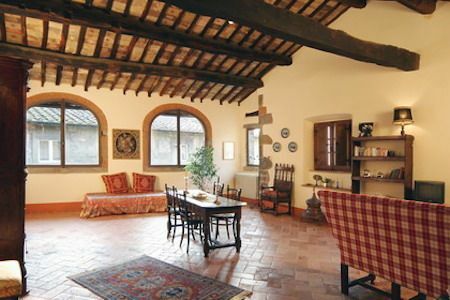 It has been finely furnished and has kept its original traditional features such as terracotta floors and huge beams. It is made up of a large sitting room and an original stone fireplace, a fully equipped kitchen with dishwasher, a double bedroom, a bedroom with twin beds, a bathroom and a shower room. Thanks to its position and charme, this property is the ideal choice for those looking for an unforgettable vacation in the heart of the Medieval town of Cortona. I was born in the south of Italy. After marrying a Frenchman I settled down in France where I lived for many years. In 2000 we decided to move back to Italy. I've always dreamed about Tuscany so I finally decided to find a house there. I love nature, antiques and architecture. Tuscany is a perfect combination of those elements. By traveling across Tuscany I randomly drove through this lovely medieval town and had a crush on it. So I asked a local what was the name of the town. She said: "Cortona". I started to visit several properties for sale and found this lovely Etruscan building. Best combination of nature and history. Walking distance to monuments, Belvedere, museums, restaurants, cafes, shops and nature. We truly enjoyed our stay in this beautiful apartment right in the heart of Cortona. Marie was a wonderful hostess, and the apartment was well-appointed and very comfortable. The views are wonderful and the setting is amazing. Thank you so much Kate, it's been a real pleasure to have you as guest! this apt. is amazing----large living area---large kitchen--and 2 wonderful bedrooms. It was so open and bright!!! The owner was so kind and helpful!! The location was outstanding!!! I recommend this apt. to everyone who visits wonderful Cortona. The apartment was very spacious, the bed was very confortable, clean, well maintained. The owner was very helpful in showing us the property and the amenities. We had thought that the apartment overlooked the piazza, but, it was 50 yards away. Lovely area, with many opportunities for long walks, shops, wine. we would strongly recommend this property, just know that the area is on a hill. the apartment includes quite a few steps to access which is why we would caution this feature. My husband, daughter and I really enjoyed our stay in this lovely, traditional Etruscan apartment. It was centrally located between free parking outside the walls and the city center on top of the hill. We really felt like we were living like the locals here and loved the many great restaurants available within a short walk from the apartment. We particularly enjoyed our dinner at Nessun Dorma and the tiramisu at Bocconchiotto, but we didn't have a bad meal anywhere in town. The apartment was clean and quiet and had everything we needed. Maria was also very sweet and accommodating. It was a little chilly during our stay and there was an extra charge for heat which we were informed of up front. Ultimately, we paid about 30 Euros per day to have the heat on, which was well worth it. We turned it off during the day when we were gone so that was only for evenings and overnights. I would not recommend the apartment for those who have difficulty walking up steps or up hills, as you need to walk a lot of both of those during your stay here, but we did not mind at all. We would definitely stay here again and our time in Cortona was one of the high points of our trip to Italy. My daughters and I found this apartment to be very nice for our stay in Cortona. It is in town about 1 block from the square, nice restaurants and shops. We were very fortunate to find parking down the hill outside the wall every day. There is a hill to climb and also steps inside the building to get to the apartment. The apartment has wifi which made getting news from home convenient. The owner was such a nice lady and made sure we had what we needed. We would stay here again. Loved it! We stayed for one week in the second floor apartment (Italian first floor). It is definitely an authentic, original building. If you are looking for luxury this is not it. HOWEVER, it is very clean, quaint, and has a lot of charm. I loved it! This apartment has everything you need on a stay in Cortona! Just a walk up Via Roma to the main piazza and the heart of Cortona - there is also a wonderful restaurant toward the top of the hill you must visit. Just a short walk down the hill is the free parking. Maria gave us access to her washing machine which was an extra bonus. You really feel a part of the neighborhood when you stay here. I was a little worried when the week we left the US we heard that Italy was getting a heat-wave of the century -- all time high temps. I knew there was no a/c in the apartment. Maria provided fans for each bedroom. I can tell you that no matter how hot it was outdoors, I felt cool and comfortable and able to sleep well in the apartment. It was nice for my friend and I to each have our own bedroom and bathroom, and plenty of room in the main areas to relax, eat breakfast, or have a limoncello at the end of the night. I love Cortona and this was a nice place to stay to get the real feel of the community. Note there are definitely some steep stairs so don't bring a heavy suitcase - I overpacked and found out I really didn't need all that stuff!